From my earliest childhood recollections, a small and humble plaque hung in my grandfather's office, placed in a prominent location on the wall directly opposite his desk. 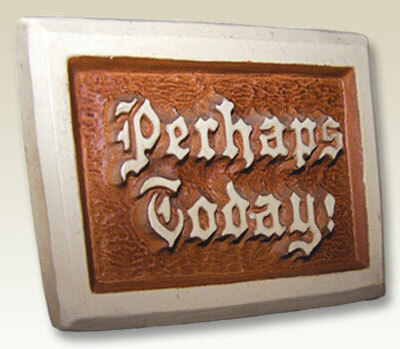 Painted in brown with ivory-colored words, it simply but boldly proclaimed, "Perhaps Today!" Though much faded with the passage of time, it hangs today in the memorial office maintained in ICR's new Dallas home. For those who knew him personally, and even those countless multitudes who knew him indirectly through his writings, this simple phrase captures the essence of what drove Dr. Henry M. Morris. Everything he said or did--whether in a book or article or lecture, or in private conversation with a grandchild--was ultimately focused on the much anticipated return of our Lord Jesus to set all things right. And yet, in one of the great paradoxes of Scripture, Christ instructed us to "occupy till I come" (Luke 19:13) even as we "see the day approaching" (Hebrews 10:25). Thus, it is clear we are to continue working without hesitation, even if the imminent return of Christ would bring sweet relief to our toil here on this earth (Revelation 21:4). Granddad believed this with all his heart and set an excellent and humbling example to those of us who remain, by continuing to work up to the very moment the Lord called him home to glory. As he so often reminded us in his writings, both the Dominion and Great Commission mandates have never been revoked. These alone provide Christians with a compelling and urgent reason to continue steadfastly in the work of the Kingdom, and ICR was established based on this same premise. Through scientific research and education, we strive to further mankind's "dominion" over this earth so that others may understand and teach the wonders of His majestic creation. And by communicating these truths, we hope to ultimately demonstrate the Creator's amazing "love toward us, in that, while we were yet sinners, Christ died for us" (Romans 5:8). And so, in this Christmas season, let us not forget God's most precious gift to us. In troubled times like these, fresh on the heels of a turbulent election and in the midst of financial turmoil that has not been seen in some time, God's people can rest in the fact that the Lord is in control and loved us deeply enough to willingly die for us! While our nation, and the entire civilized world to a certain extent, is feeling the pressures of great uncertainty and apparent loss of wealth, we can be confident that He owns it all and will "supply all your need according to his riches in glory by Christ Jesus" (Philippians 4:19). ICR claims this promise on a daily basis. But we know that our needs, while many, are but a speck in the timescale of eternity. Better yet, we should cast all our cares upon Him (1 Peter 5:7) and focus on the work that still remains to be done while He tarries. If the Lord has blessed you this Christmas season, and the work of ICR has encouraged you in some way, please share generously as the Lord leads so that our ministry may continue in strength and vigor. "Perhaps Today!" may indeed turn out to be today (and what a glorious day that will be!). But until that time, we invite you to "occupy" with us until He comes. On behalf of the entire staff of ICR, we wish you a most glorious and blessed Christmas as we rejoice on "him that bringeth good tidings, that publisheth peace; that bringeth good tidings of good, that publisheth salvation; that saith unto Zion, Thy God reigneth!" (Isaiah 52:7). Amen and amen! Cite this article: Morris IV, H. 2008. "Perhaps Today!" Act & Facts. 37 (12): 17.